Sorry it’s been so long! Mom has been hogging the computer. She finished a book she’s been working on and now is editing it. She took Stephen to soccer so I had a chance to catch up. We had an absolutely fantabulous Easter holiday! I was so excited my tail looked like it was separated from my body, it was wagging so fast. Nanny was the first to arrive. I love seeing her because she sits with me and pets me for a long time. She didn’t come out of the car until Mom came out. I think she was nervous I was going to knock her over. I really was quite crazy. I smiled my best grin and chomped my teeth to say hello. I wiggled and I think I did jump, but quickly got down when Mom yelled at me. As each member of my two-legged family arrived, they petted me and Dakota. They love how soft my fur is. I made sure I cleaned my fur and got some sun so I was glowing. 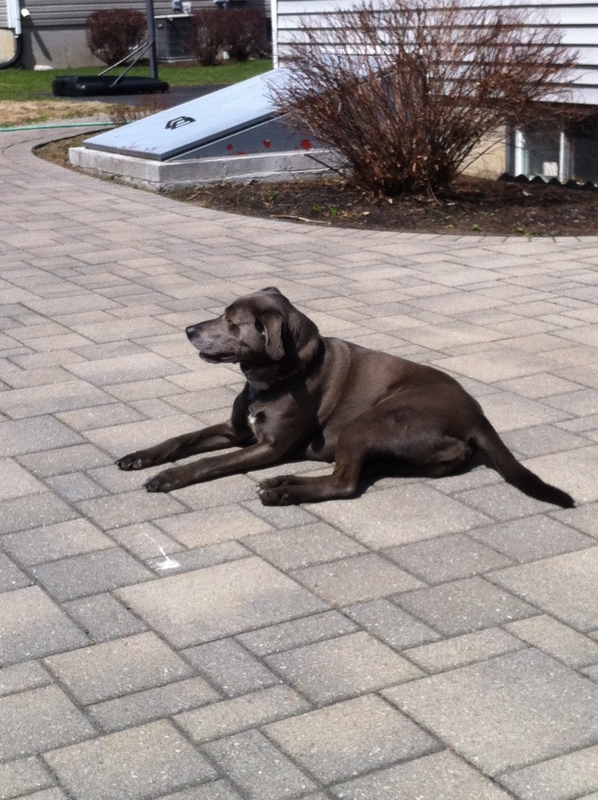 Sunning myself in preparation for my family’s visit. Always gotta look fresh! My relatives came early to make Pastichio, which is Greek macaroni. My mom snuck some to me. It was delicious. Ground beef, under pasta and a fluffy white sauce. I ran around, but as you can see Dakota was right in the thick of the activities. Sometimes I’m not sure if he realizes that he’s tired or maybe is so stubborn, he doesn’t stop. Everyone was throwing softballs in the backyard and Dakota ran back and forth to each person about 100 times! He wanted that ball! 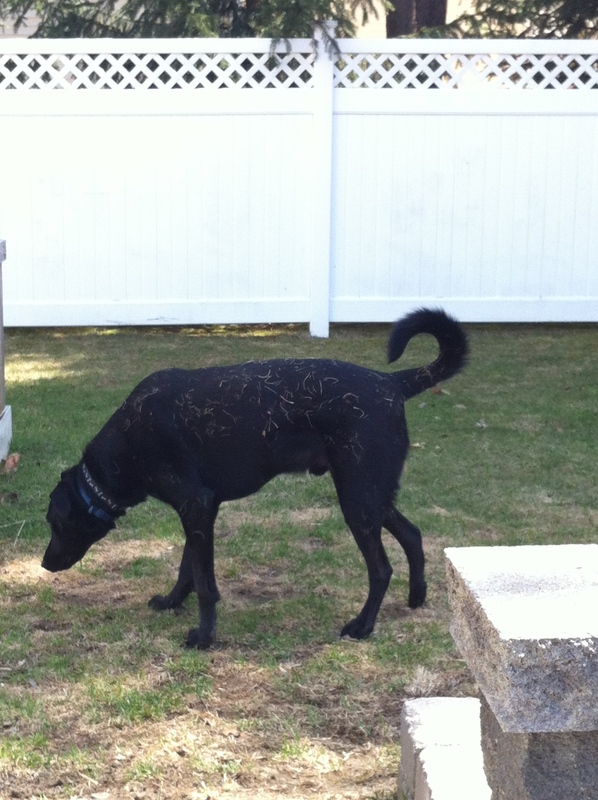 Then he rolled in the grass and was covered with it. I have to say he does know how to have fun! Dakota still looking for balls and activities even after hours of play! I know how important it is for family to spend time together. Uncle Rich was going to bring Ziggy up to play with us. We have never met him because he’s a little aggressive and Dakota is kind of mean to other dogs. (Not to me of course!) Ziggy has been sad because his brother, Buster, passed away. It’s very sad and I haven’t written about it, because it hurts so much. I only saw Buster a few times, but we really connected and now I’d like to help Ziggy feel better. He’s been very depressed. I’m grateful for the people in my life who love me as I am and who know how to have a great time together. There’s nothing better than that. 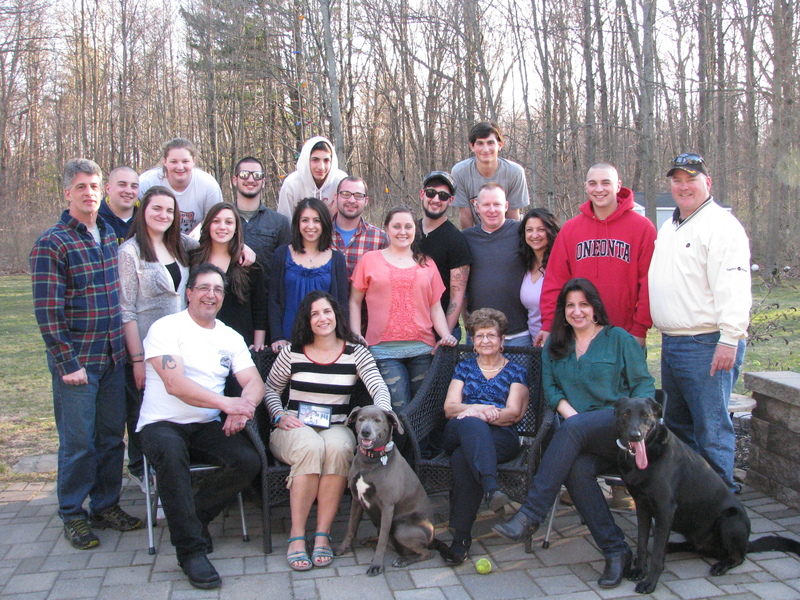 And when you have family that you love to be around, what more could you need? Of course, sometimes Dakota and I get on each other’s nerves, but we wouldn’t want it to be too boring right? We were especially lucky to have everyone together for a family photo. Dakota and I were even included! It would have been nice to have Ziggy there and my mom held a photo of her dad and my brother, Nick. They are always around. I know because I feel them, but that’s another story. That’s the Italian coming out in me!